Why would you need to know how to unclog a toilet? Just about every home in the United States has at least one toilet. Many homes have several. From time to time these toilets will clog. When they do it can be a problem. If you are not careful you can get a lot of dirty water all over the floor. What do you do? Not sure if this is your problem? See the articles 'Troubleshooting Toilet Problems' and 'Plumbing Repairs for Homeowners' for a listing of related topics. New government standards require that toilets use a maximum of 1.6 gallons per flush. That is not a lot of water. Just a few decades ago, toilets used as much as 7 gallons of water per flush. The advantage to this is you save on your water bills. The down side is that not all toilets flush well with that small amount of water. Do you really need to call a plumber? Usually not. Instead you can learn how to unclog a toilet and solve the problem yourself. Most of the time a plunger can take care of this problem in less than five minutes (clean up, if any, included). A plumber can usually unclog a toilet in a few minutes. You will still have to pay for the service call which will run $50 to $100. Would you take that much for five minutes work? Learning how to unclog a toilet is a fairly simple process. Using a plunger is about the simplest thing. A toilet auger is only slightly more difficult. You can wind up with a lot of dirty water on the floor. This can happen if you flush the toilet a second or third time when it is clogged. Plunging a toilet will also generate some splashing. Clear everything out of the area that can be damaged by water. Have some rags handy. You might want to put on some old clothes. Remember, this is dirty water, try to control it. Not much to troubleshoot. The water in the toilet doesn't go down, the toilet is clogged. You need to learn how to unclog a toilet to fix this problem. Usually you never know the reason. Sometimes it is too much volume. Other times something gets caught in the trap. Before you get started you want to make sure you don't have a more serious drainage problem. Make sure that water is not backing up into another drain, such as the shower or tub, a lower drain. If you have water backing up in multiple drains you have a sewer line problem and not a toilet problem. It may take a professional assessment to determine if the main sewer line is clogged. Check the article 'How to Unclog a Drain', for information on tracking down your problem. When you learn how to unclog a toilet you want to remember you are dealing with water. Remove everything from the area that could be damaged by dirty water. Some water will probably splash, move anything you don't want ruined. Have a mop and rags nearby, just in case. If the water level is up near the rim, you may need to get a small pail and bail some of the water out. A plunger will displace water when it is used. In addition plunging will agitate the water. A high water level will cause splashing and spillover. Newer toilets do not use much water. You may get away with flushing the toilet a second time. This sometimes can work in your favor, the extra water pressure may force the clog out. The danger is adding more water to a clogged toilet. The higher the water the greater the danger of a spill. Obviously, the water is going to be dirty, perhaps very dirty. Clean up will involve using a bleached based cleaner to disinfect the entire area. Rubber gloves are also a good idea when performing this type of repair. Avoiding toilet clogs makes good sense, especially if you have just got done with cleaning up after one. The old saying goes, 'an ounce of prevention is worth a pound of cure', is apt when it comes to toilets. A toilet that does not get clogged is one less problem in your life. Do you have a problem with your toilet right now? See the article 'Troubleshooting Toilets' to track down your problem. Want to avoid problems in the future? See the information below. Toilets are designed to use a certain amount of water to flush. In the last few decades that amount has been reduced to less than two gallons of water. Toilets have been engineered to work with that amount of water. However, if the amount of water is less than expected, problems will arise. The first thing you want to do is make sure that you have the proper amount of water in the tank. All toilets have some sort of floatation device that controls the amount of water that is kept in the tank. The water level is controlled by adjusting the float. See the article 'Adjusting the Toilet Tank Water Level' for more information. The toilet flapper is part of the toilet flush valve. The flapper is pulled up when you press down on the toilet handle. When it works properly, the flapper closes after the proper amount of water has been released from the tank. Sometimes the flapper closes too soon and not enough water is released. When this happens the flapper may need to be adjusted or replaced. For a complete discussion on repairing toilet flappers, see the article 'Toilet Flapper Repair'. Might sound a little silly, since the toilets are engineered to flush once with a certain amount of water. That is true, but when you have a large volume of material to flush, some extra water can help. Whenever there is a lot of, well, material in the basin and the toilet seems to struggle flushing it, an extra flush can help wash every thing away. Solids that are not completely washed away can be the beginning of a future clog. This is true of both the toilet itself and the drains that go into the main sewer. Extra water can help to rinse out the toilet and the sewer lines. Toilets are designed to deal with human waste. A nasty subject and a dirty job, but toilets are up for the task. However, toilets are not a disposal facility for everything in our homes that we want to get rid of. Certain materials will have a tendency to clog a toilet. Toilet paper is designed to be flushed down a toilet. The paper breaks down when it is soaked with water and will flow through drains properly. Good practice would dictate that only toilet paper be flushed down the toilet. It would be impossible to develop a list of things that you should not flush down the toilet. Common sense tells us that there are some common items that we should throw in the trash instead. The main problem is that, not all paper and non-woven cloths breakdown in a sewer system. Have you ever watched a commercial for a paper towel that absorbs a lot of water, yet does not tear? Well, that paper towel is a good candidate for clogging your toilet or sewer system. Items on this list and similar items should be disposed of in another manner. Expensive toilet and sewer problems can result from not following this advice. There is no guarantee that toilet clogs can be completely avoided. It does make sense that using some 'best practices' with your toilet will minimize the potential for clogs. If you follow the above suggestions it is likely that clogged toilets will not be a frequent occurrence in your life. The article 'Troubleshooting Toilet Clogs' helped you to identify your problem and choose the best course of action. You also learned that sometimes the toilet can appear clogged, when you have a more serious sewer problem. 'Removing a Toilet Clog With aPlunger' is the simplest way to eliminate this problem. Plungers will work for the clogged toilets the majority of the time. Most homes have one and it only takes a few minutes. When something is blocking the toilet, you may need to bring in the heavy artillery. A toilet auger will dislodge items that are caught in the trap. The article 'Using an Auger to Unclog a Toilet' covered the important information. 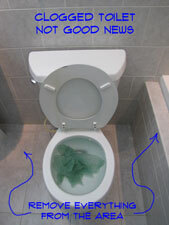 The article 'Removing a Toilet to Find a Clog' discussed the option of removing the toilet to deal with a clog. This should be viewed as a last ditch effort, when all other options have been tried. I am hoping that your ordeal with a toilet clog did not involve removing the toilet. Usually you can solve the problem with a lot less effort. Toilet clogs are a common problem. The plunger is not called the 'plumber's helper' for nothing. Have one handy for future problems. It is a wonderful feeling when you can make a repair and see such obvious results. When the toilet flushes without incident it means that no one will be bothering you about it. You can sleep at night knowing that no matter when the toilet gets used, it will work.